Photo Illustration: On the left are screenshots from Idaho Democratic Gubernatorial candidate Paulette Jordan's campaign ads. On the right, a screenshot (top) and photo (bottom) from Idaho Republican Gubernatorial candidate Brad Little's campaign material. Both candidates have released campaign material highlighting their support of Idahoans' Second Amendment rights leading up to the November 6 election. There’s a lot of talk about guns in political campaigns this year, much of it focused on regulations aimed at preventing mass shootings. But in states like Idaho, where well over half the population has guns, politicians on all sides are angling to be the most firearms-friendly candidate. Paulette Jordan, a former state representative and self-described progressive running for governor, was heavily criticized by conservative groups like the Idaho 2nd Amendment Alliance for saying AR-15s — a popular semi-automatic rifle that has been used in several mass shootings — have no place in the state. 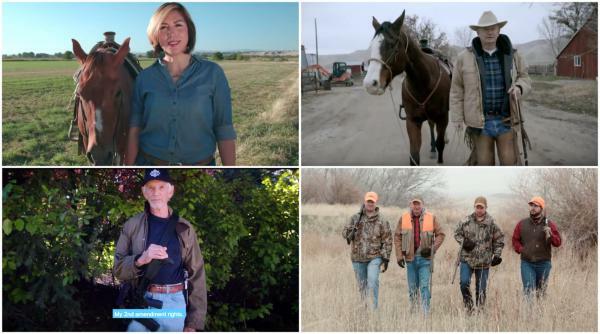 Jordan, who is trying to become the first Democrat to win the governorship since 1990, quickly reversed course: She released an ad featuring actor Scott Glenn carrying a rifle and touted her firearm bona fides. In an ad for her now failed congressional campaign, Virginia candidate Karen Mallard takes a power tool she identifies as a “grinder” to an AR-15 to demonstrate her commitment to gun control. Gun references in political ads are soaring across the country. A study released earlier this year found that 12 percent of political spots in federal or gubernatorial elections mentioned firearms. That’s up from just 1 percent in 2012. Many political ads feature candidates promising to enact gun restrictions they believe could prevent shootings like the one at Marjory Stoneman Douglas High School in February that left 17 people dead. In one such ad, Virginia congressional candidate Karen Mallard saws the barrel off an AR-15 and tells viewers “gun reform” is one of her top priorities. You won’t find ads like that in Idaho. “Candidates are just trying to show they’re the true Idahoan and you’re not a true Idahoan unless you’re walking around with a gun, riding a horse, things like that,” said Jasper LiCalzi, chair of the department of political economy at College of Idaho. This year, Democrats in Idaho are working hard to paint that picture. And according to LiCalzi, Jordan helps them toward that goal: She grew up in a Northern Idaho ranching family and has more gun credibility than her predecessors. Paulette Jordan, seen here in a photo released by the candidate, is the Democratic candidate for governor this year in Idaho. Not to be outdone, Jordan’s Republican opponent, Idaho Lt. Gov. Brad Little, appears with a shotgun over his shoulder in one television ad and smiles with a semi-automatic rifle in a campaign photo on his website. Nationally, many Democrats have made embracing efforts like “March For Our Lives” a centerpiece of their campaigns. Political groups like Everytown for Gun Safety Action Fund and Giffords PAC are spending millions this election cycle. That makes gun politics a tightrope to walk for Jordan. In March, she joined in on the “March For Our Lives” rally in Boise, as part of the national student campaign for tighter gun laws. Idaho Lt. Gov. 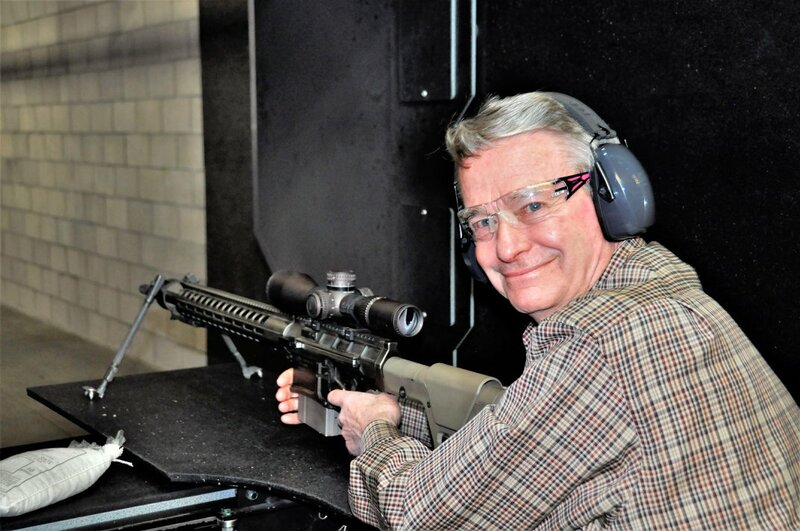 Brad Little poses with a semi-automatic rifle in a photo displayed on his campaign site. With gun regulations and the Second Amendment at the heart of Idaho’s political debates, are any rights actually at risk in the Mountain West? The region has some of the most firearm friendly laws in America. Since Idaho and Wyoming passed “stand your ground” bills this year — joining Montana, Colorado, Utah and Nevada — every state in the region now spells out in law that citizens have no responsibility to retreat before using deadly force when threatened. And every Mountain West state makes it easy to carry weapons openly or concealed. In Idaho at least, LiCalzi says the hand-wringing over gun rights is largely political theater. With Election Day right around the corner and candidates already testing the waters for the 2020 presidential election, that concern isn’t likely to abate any time soon. Update 11/7/2018 2:52 p.m.: On election night, Paulette Jordan’s run to the right of many national Democrats on firearms was not enough in ruby red Idaho. She lost in a landslide to Republican Brad Little: With most of the returns in Wednesday, she was down by more than 21 points. It was one of many disappointing results for Idaho Democrats, who failed to win any statewide office and have not won a single such election in more than a decade.